To strengthen class members’ testimonies of the First Vision and of Joseph Smith’s calling as the prophet through whom God restored the fulness [sic] of the gospel to the earth. Prayerfully study the Joseph Smith-History account of the first vision and the version in that white pamphlet thing, just so you can remember which version is the version in scripture. Look over the class member manual for the information neither you nor anyone else will ever reference. Take at the historical material presented online, which gives various accounts of the various accounts of the First Vision. Ask a class member to tell the story of Joseph’s childhood leg operation. You are not liable for any embellishments to the story that they make. Find just about any young Joseph poster you can get your hands on. Prepare the materials for the attention activity. Hold up an American flag. Note that the Gospel could only have been restored in the land of the Red, White, and Blue! Hold up a candle. Note that the Enlightenment, and with it the normalization of questioning religious dogma, created a time when the Gospel could be restored. Hold up a pair of boxer briefs (clean). Note that a man had to be chosen in order to restore the Gospel. If it seems like I’m putting in more effort at the beginning of this than the end, we both know its because you’re not going to get to the end in your lesson. After the original Apostles died, the religion of Christ moved away from whatever was originally intended. This is known as the Great Apostasy. What were the consequences of the Great Apostasy? Seriously. Think about this question. God abandoned his people. All his people. For literally centuries. We like to think of this as the great prologue to our glorious day, but think about it. Is it the fault of people born during this era that they were born then? How do you think you would have felt growing up during the Great Apostasy? Would you have noticed the lack of God? Why is it that we tend to equate the slow return of God’s influence with the weakening of Catholic ecclesiastical influence in every day life? I mean, we claim the Protestant reformers as our own, but not the Catholic ones. That’s weird, right? Before Joseph Smith was born, which events helped prepare the way for the restoration of the Gospel? Have you ever thought about how we teach ourselves that we are the culmination of human history? How does that affect our outlook on life? Is this any different than what all Americans teach their children? What about the Drumpf kids? Do you think they were taught this? 2. 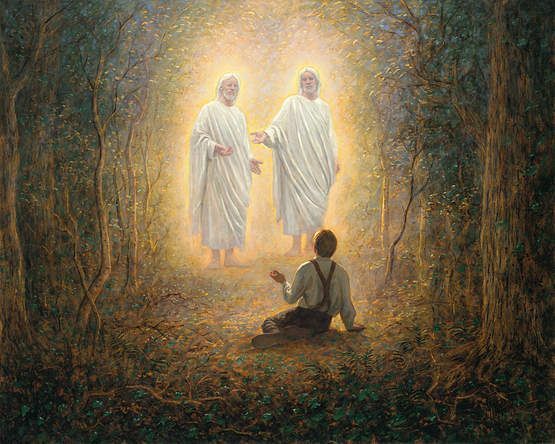 God prepared Joseph Smith to be the prophet of the Restoration. Joseph’s family was religious. Except for the ones who weren’t. Except for when they were, too. Both Joseph’s parents were believers. Joseph Sr. was spiritual, but not religious. So, that’s relevant, I guess. Apparently, if other people hadn’t been interested in religion and God, Joseph wouldn’t have been either. The First Vision, man. It’s important. Joseph saw things, ya know! Did you forget about the lesson until this morning? Here is a video you can watch. How can our young people be more like Joseph? Have they taken up leg wrestling? « Does the Source of GA Allowances Matter? 1) “The Hero Performs Amazing Feats in His Childhood” is Anthropology 101. Save it for Gilgamesh or the Bible or the movie 300. We don’t need it to strengthen our testimony of Joseph. 2) So the young Joseph practiced the Word of Wisdom even before its revelation. How wonderful! Interesting that he had no problem drinking during the rest of his life. Just not in this one instance, when it would have made a whole lot of sense. 3) As John pointed out: if we are to take the prophets as exemplars, we should refuse anesthesia at every turn because it is clearly a temptation of the devil. Pain is godly. See also: Joseph was strengthened by adversity. I chose simply not to bring up this story at all in my lesson, and it went just fine. One of these was cute and a little funny. But a mocking, snarky rendition of each Gospel Doctrine lesson, in my opinion, degrades the quality of the conversation here. It may not land like this for others, but to me, too much of this feels icky. I was moved and inspired by the caliber of thought that went into Michael Austin’s treatment of the Book of Mormon lessons and I read his work each time I prepared my own lessons. Thank you, Michael. And thanks to Sam Brunson for his thoughtful perspective of this same lesson. I will weigh in for the other side and say that J really enjoy this series. After hearing the same lessons on repeat for 40 years, this feels as true as anything that actually gets said in GD. I was inspired by this post to come up with a way to resolve the oft-debated question of how to tell whether a particular faith is a religion or a “cult”. If a member of the faith makes a joke about peculiarities of the faith (which all faiths have), are they shamed / shunned / killed by other members of the faith? If yes, then it is a cult. If no, then it is a religion. By this standard, the LDS Church is clearly not a cult, no matter what some countries may claim. Which reminds me of a joke I thought up. Why do you always invite two Mormons to go fishing? Because if you invite just one, he’ll drink all your Diet Coke. I like the story about young Joseph getting his leg operated on without anesthesia, even if it is overplayed. The temperance movement was big at that time and undoubtedly reached little Joseph, and there’s evidence Joseph Sr. was an alcoholic. You can just imagine all the thoughts in that kid’s head when he both refused the alcohol and requested his dad hold him through the horrible ordeal. What a sweet kid. As someone who attends primary every week, this is my only source of Sunday School related snark. Please continue your valuable service. These are gold. Keep it up. While they’re presented in a snarky way here, some of these questions are seriously worth thinking about. For example the way we talk about the great apostasy, when people in Europe were far more intensely religious than our society today and would certainly be very surprised to hear that God had left the world. Or the way we conceive of ourselves as the end purpose of all of history, and how that may affect us psychologically- not to mention the ways it is enormously disrespectful to others past, present, and future. Might some of those things not be the gospel, but examples of our human pride obscuring our vision of the gospel? That seems like a very valuable theological discussion directly related to the lesson material and it’s a shame we could Bennett in a million years wrestle with those topics. Many people in Europe in times past were much more intensely religious than today. Consider the effect of that on the life and career of, say, Jan Hus or William Tyndale. Recognizing that isn’t disrespectful, nor does it say God had left the world. It is just recognizing the way things were then. I am all in favour of serious thinking about the past, present, and future, but this blog is lowering itself by promoting mockery. See Ether 12:26. The way I deal with the “what about all those other people during the Apostasy” question is point to the hymnbook and note that many of our hymns were penned during that time. “For All the Saints” is not talking about LDSaints. I’ve never been anything but a fool. So, prophecy fulfilled! Thank you! I too have problems with Church being patriotic (and refuse to sing the Star Spangled Banner in Sacrament meeting) and with the idea that God abandoned his people. Individuals were still able to have personal revelation, even if there wasn’t a prophet to lead them. I believe that many of the saints had communication with God, and that he loved his people. I also have studied history and know that the middle ages weren’t without art and beauty or new thought. The printing press didn’t create new thought, it just allowed it to spread more quickly. I also have issue with the idea that the Constitution allowed the Restoration is being taught by members unwilling to allow others freedom of (or from) religion now.